WASHINGTON, Oct. 31 (Yonhap) — The defense chiefs of South Korea and the United States on Wednesday signed a strategic guideline on how their combined defense mechanism will operate after the planned transfer of wartime operational control (OPCON). The guideline, called “Alliance Guiding Principles,” contains a set of commitments to continue to station U.S. troops in Korea, retain the allies’ Combined Forces Command (CFC) and the U.N. Command, and have a South Korean four-star general lead the CFC. 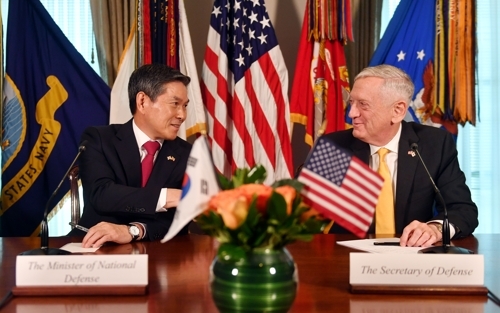 Defense Minister Jeong Kyeong-doo and his U.S. counterpart James Mattis inked the document after they held their 50th Security Consultative Meeting (SCM) in Washington, the allies’ annual top defense dialogue. “The principles are expected to address citizens’ security concerns by presenting a direction for the South Korea-U.S. combined defense system after the OPCON transfer and proclaiming the firmness of the South Korea-U.S. alliance,” it added. Among those concerns was the possibility that the U.S., with the world’s largest military, may not be willing to undertake a deputy commander role in a combined unit with its ally. But Seoul officials said that concern has also been settled through the guideline. The guideline also includes the U.S.’ continued provision of extended deterrence to South Korea and of “bridging and enduring” capabilities for the defense of its Asian ally. The extended deterrence refers to the U.S. commitment to use a full range of military capabilities, including nuclear, conventional and missile defense assets. One of them is the memorandum for the record (MFR) of the allies’ future command structure. It entails the agreement that a South Korean four-star general will lead the CFC with a U.S. four-star general being its deputy after the OPCON transition. The defense chiefs also agreed to carry out their verification next year of South Korea’s initial operational capability (IOC) to lead combined forces. After the IOC verification, the two sides will verify Seoul’s full operational and full mission capabilities. South Korea handed over the operational control over its troops to the commander of the U.S.-led U.N. Command during the 1950-53 Korean War. It was then transferred to the chief of the CFC when the command was launched in 1978. South Korea retook peacetime OPCON in 1994, but the U.S. still possesses OPCON in the event of war. The transfer of wartime OPCON was supposed to occur in 2015 but was postponed, as the allies agreed in 2014 to a conditions-based handover due to Pyongyang’s nuclear and missile tests. The U.S. Department of Defense previously said that the allies agreed to suspend the exercise. But Seoul’s defense ministry said the allies just weighed “various ideas, including suspension” in an apparent indication of differences over the fate of this year’s exercise. Mattis reiterated the U.S. commitment to maintain the current force level of U.S. Forces Korea and reaffirmed that Washington will provide extended deterrence to South Korea.